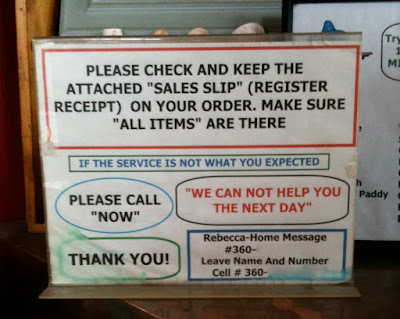 The “Blog” of “Unnecessary” Quotation Marks: call "now"
I feel like the owner of this fish and chips shop is looking for a reason to fire some people. Thanks, Janice. I wonder who "now" is. Maybe he/she is the one who said "we cannot help you the next day"? Yes, Kirsten and they didn't give the number of Mr./Ms. "now". "Can not," rather than "cannot"? Sounds like "It is within our capacity to abstain from helping you the next day." WV: candus -- how they might spell "Candace"